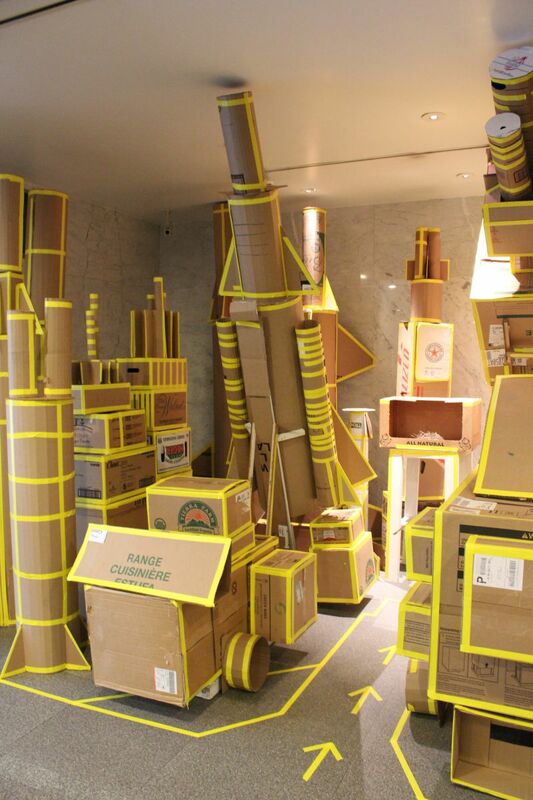 Let US Face the Future is a site-specific sculptural installation constructed from scrap cardboard and wood that the artist describes as a "prototype of Manhattan, NY." 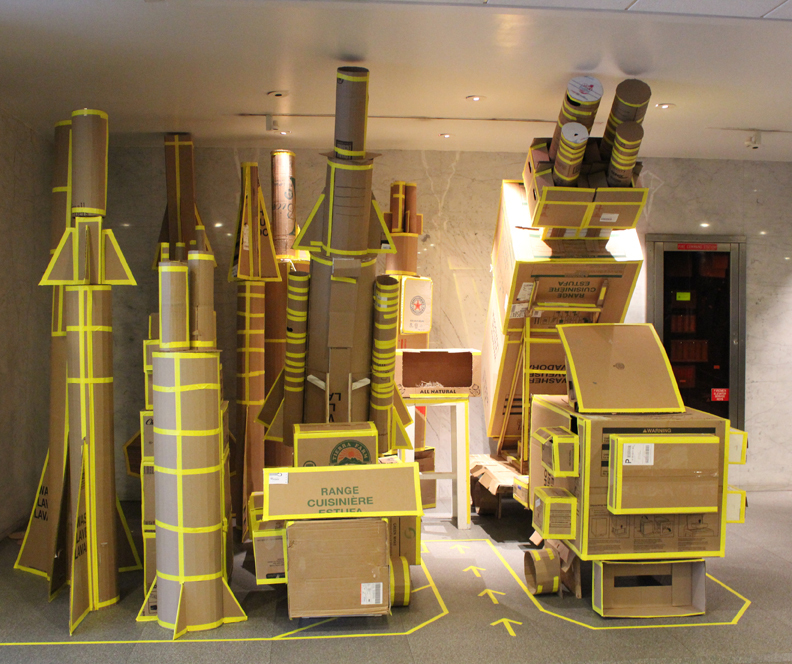 Rathod repurposed these commonplace materials to create massive constructions that resemble missiles and skyscrapers. Each component acts as a singular unit that references multiple structures of power, displaying the duality of America's assumed prosperity and supremacy via destruction and construction. Rathod developed the work as part of the 2012 Art Omi International Artists Residency program at Omi International Arts Center in upstate New York and adapted the piece for the Maiden Lane Exhibition Space. This residency was Rathod's first visit to the United States, and the work is a reflection on his initial experience in New York City. Rathod works with found, recycled, and traditional Indian craft techniques to create site-responsive works, often incorporating sculpture, performance, and/or installation. His practice focuses on social and environmental concerns and engages directly with the local environment and community issues. The site-specificity of his work allows Rathod to tailor his installations to the existing environment and create an integrated, unified atmosphere that becomes engaging and entirely new. 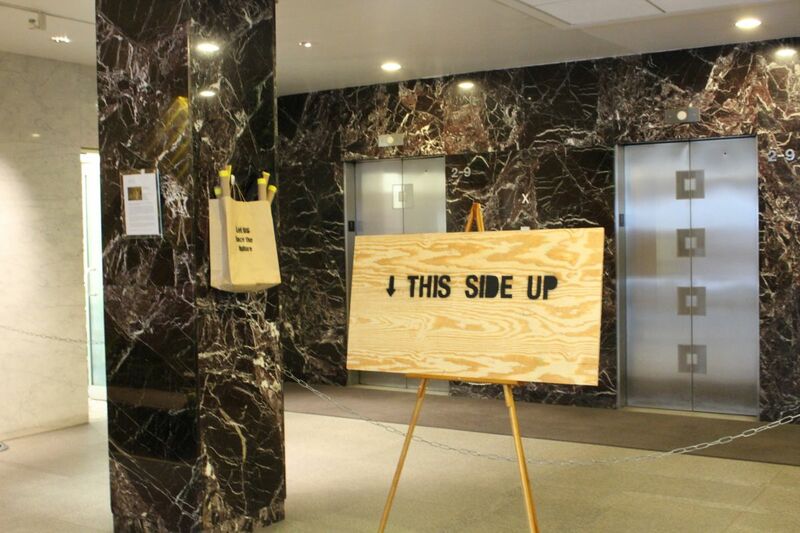 Let US Face the Future is curated by Jennie Lamensdorf and sponsored by the Time Equities Inc. (TEI) Art-in-Buildings. TEI is committed to enriching the experience of our properties through the Art-in-Buildings Program, an innovative approach that brings contemporary art by emerging and mid-career artists to non-traditional exhibition spaces in the interest of promoting artists, expanding the audience for art, and creating a more interesting environment for our building occupants, residents, and their guests.